We at Howard & Sons have already taken major steps towards reducing our carbon footprint throughout all of our departments. 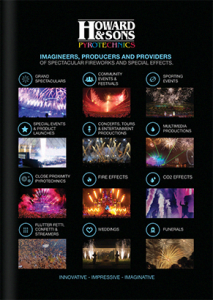 Working closely with a wide range of committees and boards within the pyrotechnics industry, we are always informed about the most recent regulations and requirements; many of these are related to reducing emissions across the board. Our policy aims to implement sustainable actions; we are committed to using the minimum of materials with the minimum of waste through increased efficiency, improved communication, responsible waste disposal, careful maintenance and use of materials to improve their longevity, and choosing products, suppliers and procedures that help to reduce all possible environmental impact on both local and global scales. We currently employ the below-listed initiatives and are constantly testing and implementing further ones to decrease our local and global footprint. Energy-Efficient Electronic Equipment and Power Saving: from LED bulbs to turning off computers when work is done instead of letting them fall into standby mode, we implement as many energy-saving methods as possible. Green Power: we only use renewable energy sources and even geothermal energy. Our manufacturing and logistics headquarters, located on a beautiful 120 hectare (298 acre) property in rural New South Wales, is a natural habitat with native flora and fauna such as blue gum trees, capertee stringybark, central tablelands grasses, cockatoos, kangaroos, wombats and yabbies. It also supports many species of snakes, lizards and butterflies. We encourage the planting of trees on this land; the property currently has more than 3,000 native trees, more than 600 of them mature eucalypts. This fauna offsets close to 400 tonnes of carbon emissions every year. Our carbon footprint is currently estimated at between 80 and 100 tonnes per year on a national (not local) level. As our remaining 2400 trees reach maturity and we continue to add new plantings this, in combination with our current waste reduction and energy-saving initiatives, ensure the continuous offsetting of our emissions far into the future. A world-leader in solar energy, Australia is also the ideal environment for further sustainable energy sources. Howard & Sons also uses energy available from the latent heat of the earth’s core, otherwise known as geothermal energy. Geothermal energy has many advantages over conventional energy sources. When building our fireworks factory, a geothermal heat pump system was installed. This pump heats several buildings including our drying rooms where pyrotechnic compounds are dried over several days in a very stable, temperature-controlled environment. Howard & Sons consciously sought out geothermal energy as a green energy alternative to reduce any impact our core business activities may have on the environment.